I use the ADAU1772 chip. When I click the Link Compile Download botton and I can find the delay information in the capture window as shown below. I want to add another delay in the sequece and I don't know the meaning of the data exactly. If I want to add a 6ms delay. How should I do and how to calculate the data I need to write. The delays in the EEPROM are all written and setup by the compiler. You cannot change them. The EEPROM contents have a checksum so you cannot find the byte and change it. Why do you need more delay when booting from the EEPROM? If I want to add a delay in the sequence and write into the EEPROM. 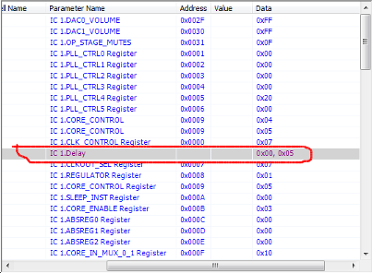 There is no need to care about the instruction set and just use the delay calculation formula 1ms x 16-bit setting. Is it right? That is a different kind of delay -- that section of the datasheet is referring to the instruction set of the EEPROM that is used during selfboot. The delay used in the sequencer window of SigmaStudio corresponds to a (1ms x 16-bit setting) delay time being written via the USBi. Is there any differences between these two description?